One of the many robotic spacecraft currently science-ing away in various corners of the Solar System is an orbiter called Venus Express and is run by the European Space Agency (ESA). One of the instruments it carries to study Venus is a spectroscope, which allows scientists to study the chemical composition of any gas from a distance, by splitting the spectrum of light passing through it. The spacecraft was recently able to point its spectroscope at a bright star, through the edge of the planet’s atmosphere, and after careful analysis the science team concluded that they had found ozone. 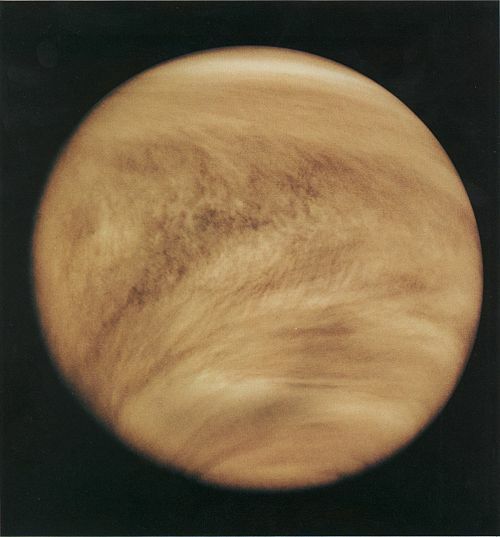 In many ways, Venus is the twin of Earth (although not identical twins – they have almost the same size and composition, but conditions on the Venusian surface are hot enough to melt lead, and the atmospheric pressure is as high as at the bottom of the Earth’s oceans. ), and the presence of an ozone layer is just one more aspect the two worlds have in common. Naturally, speculation has already started that the presence of ozone might indicate life. I’m skeptical, partly because of the incredibly harsh conditions Venusian life would have to survive, but mostly because any time anything new is discovered, the press release finds a way to imply that it has something to do with extra-terrestrial life. Enough already!